For many years, concept artist Eliott Johnson Lilly has been receiving questions regarding the concept art industry and how aspiring artists can get a job. Lilly is a concept artist with ten years of experience and this book is the response to those questions. The coverage is quite comprehensive. Even though I'm not an aspiring concept artist, I still found the information to be very illuminating. This book is based on Lilly's experience rather than all on facts. The content covers things like what it takes to be a concept artist and what they actually do. Lilly provides an insider guide and shows you around the industry and how work actually gets done, and how the whole place functions. Its like following him like around the studio as he explains the job. He also talks about the daily life of a concept artist and gives an example of one of his good days and bad days. You'll also get tips on education, how to choose a school and what to study. There are self help tips on how to develop yourself artistically and technically, and how to create and present your portfolio. 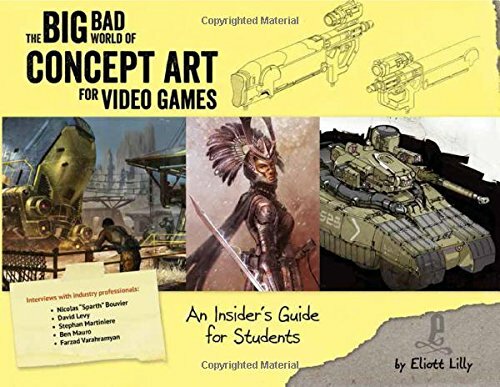 What I like about the book are the many examples and insider "secrets", like how you can get fired for leaking images, or posting work without permission, which is why it's so difficult to find game related art even on concept artists' websites. There are other miscellaneous things like how eating junk food will make you overweight, how people keep quiet when a video game flops, managing gossips and rumors, whether you're wasting your time and your parents money, talent vs hard work, internship. Everything is written in a no-nonsense and engaging manner and is brutally honest. Finally there are interviews with other selected well known concept artists such as Nicolas "Sparth" Bouvier, David Levy, Stephan Martiniere, Ben Mauro and Farzad Varahramyan. These guest artists will tell you their version of what it's like to be concept artists, and also provide useful tips and warnings. It's great to read about the different experiences. This is a highly insightful book. It's a 144-page paperback published by Design Studio Press. Recommended to all aspiring concept artists and students. Some images from the portfolio pages and what looks like fanart.